HOW TO MAKE $10,000 A MONTH USING GOOGLE ADSENSE!!!! 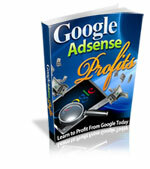 Many internet webmasters are now making over $10,000 a month with Google AdSense!!! and you can join in on the action for your cut too. Learn how you can make thousands of dollars a month in extra income by effectively using google adsense on your website. Google's Adsense is grossing well over $10 billion a year and they want to share that with their media partners that host their ads.